To get to the truth about these prophecies of Daniel in chapter 2 and 7, we must pray to God that He will guide us and lead us. We must compare scripture with scripture and compare it with what has happened in world history. So let's begin with these amazing prophecies of Daniel. In Daniel chapter 2 we find King Nebuchadnezzar having a dream which went from his mind, and this dream troubled him. So he summoned all the great magicians of the kingdom to tell him what the dream was and what it meant ... Daniel 2:2 ... 'Then the king commanded to call the magicians, and the astrologers, and the sorcerers, and the Chaldeans, for to shew the king his dreams. So they came and stood before the king.' ... The only problem was, the King couldn't remember this dream, he was troubled by it, but he couldn't remember the contents of it. How many times do you wake up from a dream and it's gone from you in a moment? It certainly happens to me. Now these magicians and sorcerers got their powers from satan, but do you know what satan cannot do? He cannot read minds. He has limited power on this earth, and so the stage was set for God to receive glory by revealing the dream to Daniel. So King Nebuchadnezzar issued a decree to slay all the magicians and sorcerers, because they could not make known to him his dream ... Daniel 2:12 ...'For this cause the king was angry and very furious, and commanded to destroy all the wise men of Babylon.' ... Daniel and his friends were to be killed along with the wise men, so Daniel goes before the King and asks for time to interpret his dream. So Daniel was granted time to do this, and he went home to tell his three friends about it, and together they prayed to God for mercy, to reveal this secret dream so that they would not be slain ... Daniel 2:18 ...'That they would desire mercies of the God of heaven concerning this secret; that Daniel and his fellows should not perish with the rest of the wise men of Babylon.' ... Then God did something which a lot of the Christian world today do not put faith in - He revealed the secret dream! ... Daniel 2:19,22 ...'Then was the secret revealed unto Daniel in a night vision. Then Daniel blessed the God of heaven. He revealeth the deep and secret things.' ... There are so many Christians today who don't study bible prophecy, because they think it is too complicated. Well, how about taking a leaf out of Daniel's book and coming before God in prayer and trusting in Him to reveal the truth about Bible prophecy to you. So we have this great image of a man, whose head was Gold, breast and arms of Silver, belly and thighs of Brass, legs of Iron and feet of part Iron and part Clay. So what does this image and it's different parts represent? ... Daniel 2:38-40 ...'And wheresoever the children of men dwell, the beasts of the field and the fowls of the heaven hath he given into thine hand, and hath made thee ruler over them all. Thou art this head of gold. And after thee shall arise another kingdom inferior to thee, and another third kingdom of brass, which shall bear rule over all the earth. And the fourth kingdom shall be strong as iron: forasmuch as iron breaketh in pieces and subdueth all things: and as iron that breaketh all these, shall it break in pieces and bruise.' .... So the different parts of this great statue represent KINGDOMS of this world. We know where to start, because Daniel confirms that King Nebuchadnezzar and his kingdom of Babylon was the head of Gold. So can we tell from history who the other kingdoms were? Yes! After Rome fell in 476 AD, the world divided into different kingdoms. Up until the end of Rome, there was always one main ruling world power, such as Babylon, Medo-Persia, Greece and Rome. But after Rome fell, this ended and the world split into divided kingdoms. This is represented in this great image by the feet of part Iron and part clay. So this image of the great statue is a view of the whole of world history, showing the ruling kingdoms of the earth, and we are living in the time of the feet of this image. Now notice what happens after the time of these divided kingdoms ..... Daniel 2:33-34 .....'His legs of iron, his feet part of iron and part of clay. Thou sawest till that a stone was cut out without hands, which smote the image upon his feet that were of iron and clay, and brake them to pieces.' ..... That stone, or Rock, is none other than Jesus Christ and His kingdom. Friend, we are living in the very end times and the next kingdom that will conquer this earth is Christ's kingdom, when He returns at the second coming. Many people, including Christians are waiting for a one world government to be set up, that will rule the earth. Yes, there is no doubt that the powers of this earth are trying to set up a one world government that will totally rule the world and they will succeed to a certain extent to be able to enforce the mark of the beast. But the world will never become united under a single world nation again like in the past under Babylon, Medo-Persia, Greece and Rome. You see, God revealed to Daniel that Rome would be the last single one world ruling kingdom. After Rome, on this great image, we have the feet of iron and clay. Now what did Daniel say about the feet? After Rome fell, it split into the kingdoms of Europe. Now we know that people in the past have tried to unite Europe into one nation to rule the world, and they will continue to try like the European Union and United Nations are doing today, but as we can see from the prophecy of Daniel 2 above, they shall not 'cleave one to another' and shall not succeed. The leaders of this world can try all they like to form a one world united ruling nation, but if God has shown through bible prophecy that it cannot happen again, then it won't. Don't get me wrong, the nations of this world will come together in "agreement" for a short time to force the laws of the beast (Roman Catholic Church) upon the world, as it says in Revelation 17:12-13 that the ten kings shall give their power to the beast and reign with the beast for "one hour". You will see in Revelation 13 that one of the end time beast powers (see America in Prophecy) causes the earth to receive the mark of the beast (mark of Roman Catholic Church), and any who refuse, will be killed. So we will have two earthly "powers" so to speak in the last days. The sea beast of Revelation 13 that gets it's power from the "ten kings" (kingdoms), and the earth beast of Revelation 13 which is America. But notice that Daniel says this final earthly power will be partly strong from the iron of Rome, and it will also be weak from the clay and it won't be able to cleave together properly. Therefore this "agreement" between the kingdoms will only last a short time. The only completely united single ruling kingdom that is coming is the Kingdom of Christ Jesus, which will smash the kingdoms of this earth to pieces and will reign forever more! Praise God! Keep in mind that the power of Rome, the iron in the feet, would continue to the end. This takes us on to the prophecy of Daniel in chapter 7. This is a parallel prophecy of Daniel 2, where we saw the different parts of Nebuchadnezzar's image representing the four main kingdoms of the world, plus the 'divided kingdom' which is the time we live in now (the feet). This time in Daniel 7 we have four beasts, which represent the four world kingdoms. In this chapter Daniel goes into greater detail about these kingdoms. How do we know that these beasts represent kingdoms? ... Daniel 7:17 ...'These great beasts, which are four, are four kings, which shall arise out of the earth.' ... 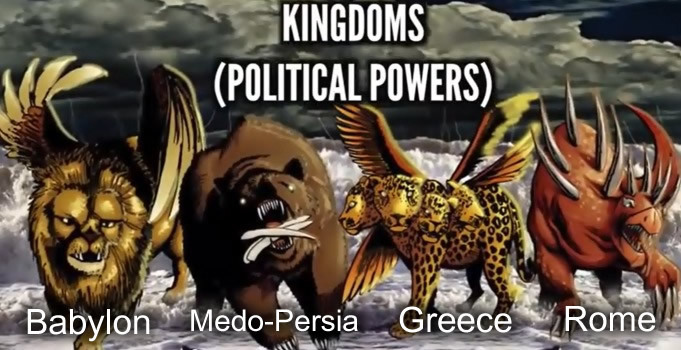 This is confirmation that these four beasts are four kings (kingdoms) which rise to power in the earth. So let's look at these beasts. Daniel 7:3 ...'And four great beasts came up from the sea, diverse one from another.' ... Notice first that these beasts came up from the sea. Now water in bible prophecy represents people, nations ... Revelation 17:15 ...'And he saith unto me, The waters which thou sawest, where the whore sitteth, are peoples, and multitudes, and nations, and tongues.' ... So the four beasts rise up from largely populated areas of many different people. Daniel 7:4 ...'The first was like a lion, and had eagle's wings: I beheld till the wings thereof were plucked, and it was lifted up from the earth, and made stand upon the feet as a man, and a man's heart was given to it.' ... This beast was Babylon (Head of Gold). The Lion is regarded as the greatest of beasts, and just like the head of Gold, the greatest of metals, Babylon was the greatest kingdom. Also, the symbol of a Lion was associated with Babylon. In Ezekiel 17, Babylon is depicted as a 'great eagle with great wings'. God gave Babylon it's power, but then the wings were plucked off, and the kingdom lost it's power and was conquered by the next kingdom. Daniel 7:5 ...'And behold another beast, a second, like to a bear, and it raised up itself on one side, and it had three ribs in the mouth of it between the teeth of it: and they said thus unto it, Arise, devour much flesh.' ... This beast was Medo-Persia (Chest of Silver). This bear is 'raised up' on one side. As you can see from the name 'Medo-Persia', this was a dual kingdom. Persia was the stronger kingdom, hence this beast being 'raised up' on one side. This bear also has 3 ribs in it's mouth, so it's obviously just devoured something. This represents the three notable conquests of the Medes and Persians, which were the kingdoms of Lydia, Egypt and Babylon. Daniel 7:6 ...'After this I beheld, and lo another, like a leopard, which had upon the back of it four wings of a fowl; the beast had also four heads; and dominion was given to it.' ... This beast was Greece (Thighs of Bronze). Now the Leopard is an animal of great speed, and with the 4 wings, this represents great speed and power also. It is well known that Alexander the great conquered the known world with amazing speed. The four heads represents the four divisions that Greece split into after the death of Alexander. It is known that 4 generals took control of Greece. Daniel 7:7 ...'After this I saw in the night visions, and behold a fourth beast, dreadful and terrible, and strong exceedingly; and it had great iron teeth: it devoured and brake in pieces, and stamped the residue with the feet of it: and it was diverse from all the beasts that were before it; and it had ten horns.' ... This beast was Rome (Legs of Iron). This nation is so terrible and powerful that Daniel can only describe it as a dreadful beast. Rome was known as the iron kingdom, which matches the iron teeth on this beast and the iron legs on the statue. Notice that this beast was 'diverse' (different) from all the others. Whereas all the other kingdoms were totally political nations, Rome became a 'Religio-Political' nation, when the Roman Catholic Church (The Papacy) received power to rule. Notice also that this beast had ten horns. When Rome fell in 476 AD, it split into ten kingdoms of Europe ... Daniel 7:23 ...'Thus he said, The fourth beast shall be the fourth kingdom upon earth.' ... This verse confirms that the fourth terrible beast is Rome, because Rome was the fourth kingdom to rule after Babylon. So to summarize, the following shows what the great image and beasts represent. So the prophecies of Daniel reveal that we are living in the last 'age'. There are no more earthly kingdoms to be setup after the feet of Nebuchadnezzar's image, which is where we are today. One day soon, Jesus will return as that 'rock' and will destroy the kingdoms of this earth and replace it with His Heavenly kingdom. This is the kingdom we need to be watching and waiting for. This is an everlasting kingdom! Are you living for the kingdom of heaven?